Scientists estimate that some aspen clusters in Utah and Colorado may be as old as 80,000 years. Photo via T Wildlife/Thinkstock. he Earth’s largest living organism, they say, is a patch of forest in south-central Utah. It sprawls across more than 100 acres and likely weighs around 13 million pounds. To the casual observer, the roughly 47,000 tall white aspen trunks that make up Pando — Latin for “I spread” — may look like individual trees, but their genes tell a different story. They’re clones, every one, genetically identical and connected by one underground root system. Across the Mountain West, clonal aspen colonies like Pando cover hillsides and valleys, filling in open spaces after fires or logging or avalanches disturb the ground until, eventually, slower-growing conifers overtake those aspen colonies. And while aspens are one of the iconic trees of the West, they also grow in Mexico and Alaska, along the West coast in the Sierra Nevada and east to Newfoundland. Sometimes they spread through their roots, and sometimes they send out seeds — billowy catkins like their cottonwood cousins. They are North America’s most widespread tree. My favorite spot to hike among these expansive groves is at the edge of Colorado’s Raggeds Wilderness along Kebler Pass. It’s a spot I discovered a few summers ago while hiking the 14-mile Dark Canyon trail. The path weaves along Anthracite Creek — where in mid-July tart serviceberries ripen on leafy bushes — and then up the precipitous Devil’s Staircase. As the trail climbs, it opens eventually to a quiet grove of aspens whose vibrant green canopy shelters a carpet of lush ferns, blue lupines and yellow mule’s ears. It looks like a fairy tale, like a wood nymph might be peering from behind a slender trunk, or the eye-shaped branch scars just might wink. In the fall, the scene transforms, and the aspens’ leaves turn shades of golden yellow and reddish orange, shimmering against alabaster bark. It’s an ephemeral and cinematic sight that has been playing out for thousands of years. Just how many? To measure the age of a tree, you count its rings. But how do you measure the age of an aspen clone? The individual trunks in an aspen grove might be 60, 80, maybe 100 years old, but the grove itself could be far older. People have wagered guesses based on the history and ecology of a region, and scientists have studied patterns of mutation to get an estimation. Some scientists say our western aspens may be a few thousand years old, while others believe a more shocking 80,000 years, but no one has yet found a way to say for certain. Across the West, vast clonal aspen colonies cover mountainsides and valley floors. New threats endanger their existence. Photo by Michael Clark. While the age of the grove is still being debated, the span of one tree is roughly the span of a human life. And etched into some of these trunks on Kebler Pass is the evidence of people who have passed this way before. Maybe lovers, or a sheepherder or logger, have carved initials and years into the white trunks. Over the years, the scars expand until a knife mark is as thick as my finger, but I can still make out the numbers, tumbling back decades, some into the ’40s. This glimpse into recent history makes it feel as though these forests will last forever. But scientists say these aspens could disappear if we don’t slow our carbon emissions. Since the end of the 20th century, western aspens have been in general decline. Fires, which help them stay ahead of competition from conifers like pine and spruce, have been routinely suppressed. Increasing heat and drought, coupled with insect infestation and disease, contributed to a syndrome called Sudden Aspen Decline roughly a decade ago. Then, in 2015, researchers discovered how heat and drought — two conditions expected to increase in the Southwest because of climate change — can produce air bubbles in the tubes that carry water through an aspen tree, killing the trees. If you pick up an aspen leaf and roll its stem between your fingers, it won’t spin smoothly like other leaves. Instead, square edges make the stem twist unevenly, sending the leaf gyrating. That’s what makes an aspen forest seem to shiver in the slightest wind and gives the tree its descriptive Latin name: Populus tremuloides. In this grove, a few fallen logs offer a resting spot for weary hiking legs. I like to stop — to rest, and to listen. When even a gentle breeze whispers through the forest, all the leaves rustle in concert. 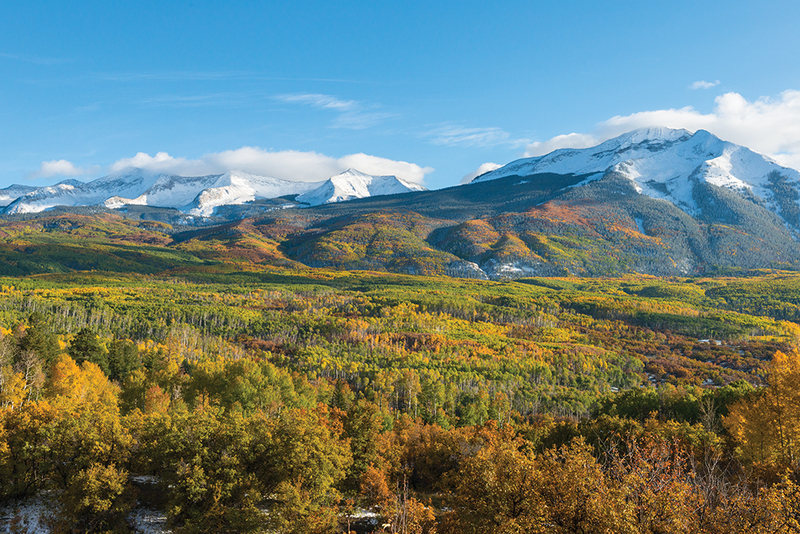 In autumn, they’ll shimmer golden against an azure sky, drawing crowds who’ll drive the 30 miles over Kebler Pass to get a glimpse and a photo before the pass closes for winter. But in this moment, on this log, time seems suspended, as if the seasons and this forest will never change.